Core out the stem of the tomato by circling the tip of a paring knife around the stem in a cone shape. Score an "x" in the opposite end and drop the tomato into the boiling water. Blanch for about 30 seconds to 1 minute, until the skin begins to peel up around the "x". Remove with a slotted spoon and drop into a bowl of ice water to stop the cooking. Peel the tomato and cut it in half crosswise. Using your thumbs, scoop the seeds and juices out of the crevices. With a paring knife, slice out the interior membranes, leaving a bowl-shaped tomato exterior. The exterior and interior can then be rough chopped or diced to the desired size. 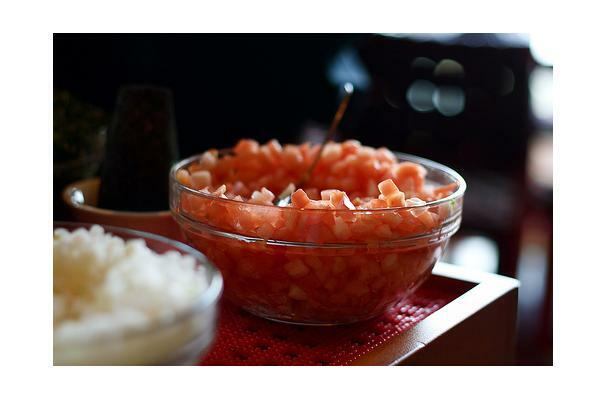 Tomato concasse is a method of removing the skin, seeds and membranes of a tomato and chopped to a specific dimension: roughly chopped, or small, medium or large dice.